The Sleek Geeks - Dr Karl Kruszelnicki, Julius Sumner Miller Fellow at the University of Sydney, and Adam Spencer, Mathematics and Science Ambassador at the University of Sydney - want their audiences to 'Learn something without even noticing'. By communicating science in an entertaining, creative and engaging way, the Sleek Geeks and the students who enter the Sleek Geeks Science Eureka Prize painlessly increase their audience's science knowledge. Teachers across Australia support their students to enter the prize, from workshopping film ideas, to providing technical help and resources, to providing class time to get the creative pieces ready. So who better to tell us what entering the prize is really like? At Warrandyte High School in Victoria, Claire Bloom, digital media teacher, and Dave Davies, retired science teacher, have had success with their students winning prizes for the past three years in a row, plus earlier prize winning in the Sleek Geeks Science Eureka Prize. "Way back in ancient history, we regularly watched an ABC TV show called 'Sleek Geeks' - it was funny, factual and entertaining. Our science department used the show in classes, and the kids loved it. On the show, Adam Spencer and Dr Karl mentioned their Eureka Prize video contest, and planted a seed in our minds," said Mr Davies. "Being inspired by the Sleek Geeks on TV, six of our students approached us about making a video clip for the 2008 Eureka Prizes. They had little idea of what to do and we had even less! As they were music students, we decided we should try and include some original music in our clip," explained Ms Bloom. Their 2008 entry 'The Inland Sea' won a Highly Commended prize and set the school on the path to musical Sleek Geeks Science Eureka Prize successes over ten years, winning a second prize, two third prizes, and three highly commended prizes. "This first win in 2008 was a surprise and got us hooked! The whole school has really got behind our efforts, which still occur in an extracurricular way, during lunchtime, after school, weekends and holidays. We love to premiere our annual entry at a whole school assembly and at our annual parent fundraiser, the school trivia night," said Mr Davies. "Interestingly one of our original Sleek Geeks Science Eureka Prize students is now a physics and maths teacher at Warrandyte High. We love showing his students that very first entry!" said Ms Bloom. Our students like to make the films fun - just like the Sleek Geeks - and include some zany scenes, however at the basis of the films is serious science. Each year our students are inspired by our past entries, as we play the films at whole school assemblies. So everyone gets behind each year's creators, wishing them luck, whilst learning about an interesting scientific concept. This always inspires the next year's Eureka Prize entry. At junior levels for various subjects, we incorporate a video task to get students familiar with the power of visual media to convey an idea and educate people of different ages. Even just using their mobile phones, with minimal editing allows students to achieve great results. Taylor Bell, Year 6 teacher at Bassendean Primary School in Western Australia, gets the whole class involved in the Sleek Geeks Science Eureka Prize by making it a class activity with an assessment component. "I heard about the Sleek Geeks Science Eureka Prize through Ed-Email sent out through the Department of Education Western Australia, and I chose to enter my students because I thought it would be a brilliant way to introduce students to science concepts through a digital format," said Mr Bell. The films were done as a whole class task, with an assessment component on the science inquiry skills and science as a human endeavour. "What impressed me most was the level of research and creativity the students displayed in the film task. Whilst they may not have been able to demonstrate their full understanding digitally, they were all thoroughly engaged in their work and completed a great deal of research on their respective topics," explained Mr Bell. "My students really got a lot of enjoyment out of it, and allowing them the creative reins to choose their topic and how they wished to convey their message in that digital format let them demonstrate a great deal of creativity and independence." I encourage any teacher to give it a go - the kids really enjoyed the idea. Next time I would probably teach my students more video editing skills beforehand! Dave Maddock, teacher at Kurri Kurri Public School in New South Wales, also makes it a class challenge to enter the Sleek Geeks Science Eureka Prize. "I have loved the Sleek Geeks Science Eureka Prize since we began entering - the kids are always inspired and excited and love the whole process. While our entries aren't always prize winning quality, they are always the kids' work from start to finish, and the fun they have creating their entries along with the pride and self-belief this helps instil is priceless," said Mr Maddock. "Our school first found out about the Sleek Geeks competition when we were searching for interesting challenges that we thought our students might enjoy. We wanted something that involved using technology and would allow our students to personalise their learning with topics they were naturally curious about." The Kurri Kurri Public School students research, plan, experiment and script, as well as perform, film and produce their movie projects on science based concepts or questions that they have chosen as a group. "We set up support for the Year 5 entrants from Year 6 students who entered the competition the previous year, who help the younger students develop the skills and understanding to successfully complete their film projects," explained Mr Maddock. "Our students love making the films and often surprise us with their choice of topics, inventive presentations and experiments. The whole process builds creativity, teamwork and independence, and motivates our students to explore and question the world around them… and it's fun!!!" Provide a structured scaffold for the whole process with a strict timeline and check-in dates. It goes quicker than you think, so stay on track. Ask your student teams to submit a proposal at the beginning, outlining their ideas and any resources they need. Topic choice is important because sometimes the ideas are too big to be achievable and occasionally we need to encourage students to think outside the box and be a bit more creative in their topic choices. Hold back and let the students do their jobs, the teacher is really there just for technical support and to help them stay on track. Min Fang, science teacher at Asquith Girls High School in New South Wales, embedded the Sleek Geeks Science Eureka Prize into their Year 10 enrichment class program, and had success with her students winning a 2017 Highly Commended prize. "Dr Karl, one of the Sleek Geeks, has been a personal hero of mine for years, so I have always known about the competition," said Ms Fang. "It is one of the best competitions out there to enthuse students in science, because it is free to enter, allows students to express creativity and has academic rigor. "The best part of the competition is the fact that video production is a very open-ended process - you are not limited by availability of resources or by the current topic studied in class. The competition is open to any student and the sky is the limit on what can be done: students are able to choose to explain difficult concepts, such as time, that may not necessarily be part of a normal science syllabus. "I am confident that all my students benefit from engagement with the competition. My head teacher, Paul Devonshire, is a leader in student-centred learning and differentiated learning opportunities, and he encouraged me to embed this competition into our Year 10 enrichment class program," explained Ms Fang. "I am so proud of all of my students for the effort and time they spend on forming storyboards, recording, retaking and editing their videos. I love the excitement when they come to the classroom and say, "Miss do you want to see my video?" Mostly though, I was impressed with the creativity, critical thinking, collaboration and communication skills that were unleashed through participation in the project." On the Highly Commended prize win by her students Ella Harris, Kahlia Rae and Amelia Welsh in 2017, Ms Fang says: "It is achievable. When we looked at winning videos from the previous years, the depth and quality made the competitionvery daunting. We didn't expect to win anything. When the girls won their prize, they became role models for the rest of the school - we showed their video at a whole school assembly and used it to inspire others to have a go next time." Go for it! Think outside of the standard where science departments enter students in examination type competitions. Your students will love it. It is different and helps them to express their science in a different format. It is one of best experiences students will encounter in a class. Have I mentioned it is FREE?! Ilia Tsoutouras, Principal of Virginia Primary School in South Australia, had one of his students, Toby Trenwith, become a 2017 Highly Commended winner in the Sleek Geeks Science Eureka Prize. "Toby was a Year 7 student of ours who was very self-driven in terms of inquiring into a range of different projects. He was the only entry and entered off his own accord, bringing it to my attention in terms of support as a coordinator," said Mr Tsoutouras. "We were obviously very proud of him as a school, as his passion in science will no doubt now inspire other students at Virginia Primary to enter such competitions in the future." So what are you waiting for? 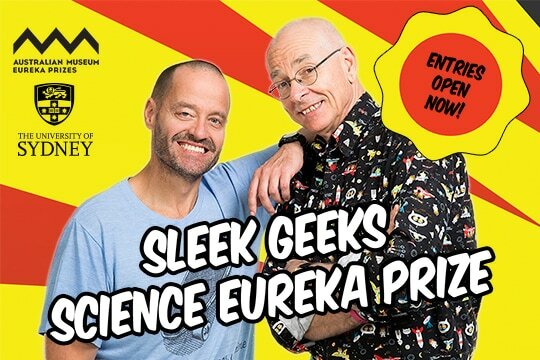 Enter the University of Sydney Sleek Geeks Science Eureka Prize.